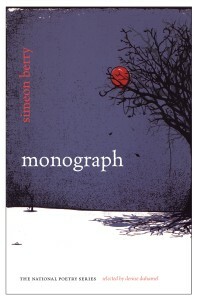 Simeon Berry’s Monograph—“a treatise or detailed study of one relatively narrow topic”—focuses on the failed marriage of the speaker and his ex-wife, N. Berry’s writing is hard to categorize; as the epigraph suggests, it at once feels like a treatise and detailed study, but also poetry, flash fiction, memoir, confession, and a series of vignettes. Berry states, “Don’t mistake this for language. This is a blueprint.” The genre of this collection, however, is less important than its smoothness. Across the bumpy road of this marriage, Berry’s collage slides the reader with ease. Jake Bauer is an MFA candidate at The Ohio State University.